An extremely complex lighting system bathed both the market and palace itself in a romantic light, transforming the entire area into an illuminated wintery Christmas landscape. The external decorations on wood cabins and marquees purposely avoid cheap plastic adornments, instead featuring only natural materials and specially developed wooden rubbish bins. The neat look is achieved through meticulous cleaning and environmentally friendly, waste-reducing reusable catering systems. 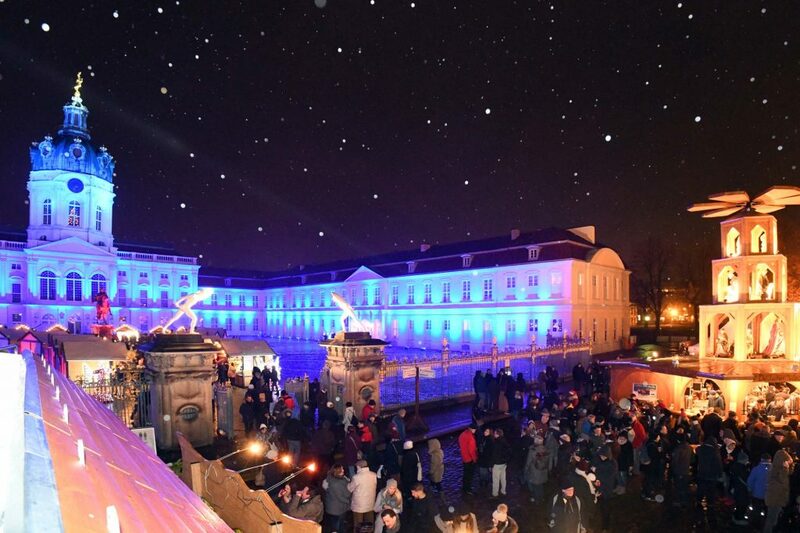 The palace square successfully hosted Berlin’s largest winter open-air restaurants, which saw top dining from the Berlin and Brandenburg hotel and restaurant scene presented in over 30 heated and additionally illuminated marquees. The combination of wintery treats, Christmas shopping and a visit to the palace and its grounds is well received by patrons: No other Christmas market in Berlin offers such a unique mix of experiences, with both interesting tours through Charlottenburg Palace and festive Christmas vibes. This year we have again two nostalgic carousels for our little guests on offer, which can be used free of charge.